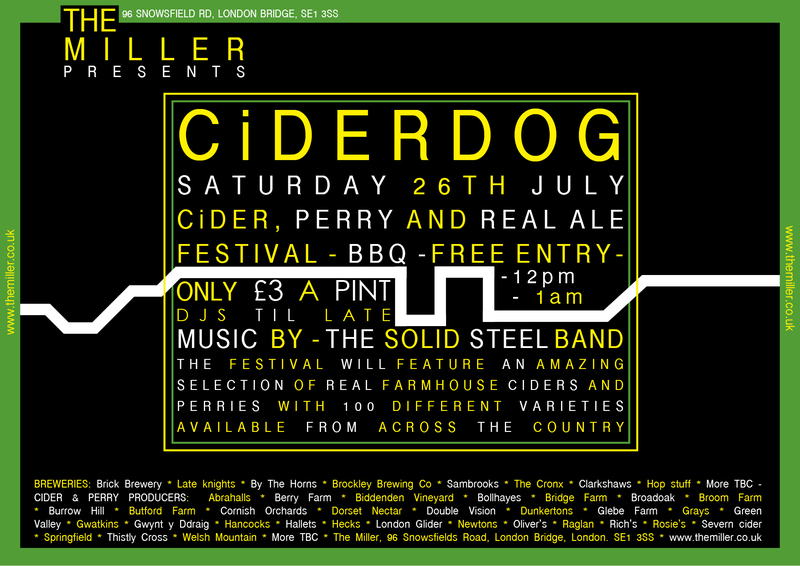 Following the success of last year’s #CIDERDOG The Miller will once again be holding a FREE Cider, Perry and Real Ale festival on Saturday 26TH July. The festival will feature an amazing selection of real farmhouse ciders and perries with 100 different varieties available from across the country. Once again ales will focus on South London Microbrewers, including Brick Brewery, Late Knights, By The Horns, Brockley Brewing Co, Clarkshaws, Sambrooks, The Cronx and Hop stuff. The BBQ will offer Hotdogs, Burgers, Pulled Pork and grilled Chicken (all meats supplied by Ginger pig), vegitarian options, salads and our focaccia freshly made and baked in the pub. The Solid Steel Band will be entertaining guests throughout the day. Entry is free all day from 12pm to 1am. The Miller is run by the team behind East London pub The Sebright Arms. All Cider and Perry will be £3 a pint.